For technical reasons the photograph that introduces our blog has been severely curtailed. Here is the full version of the picture taken during the excavations from 1976 to 1980. It shows all four trenches that were investigated during this campaign. The eastern trench is in the foreground. Behind it is the middle trench and at the back the western and the exploratory trench can be seen. The picture also illustrates very well the position of the pile dwelling at the foot of Omberg Hill. The hill rises to 263, 5 m above sea level and was certainly of significance for the localization of the pile dwelling. 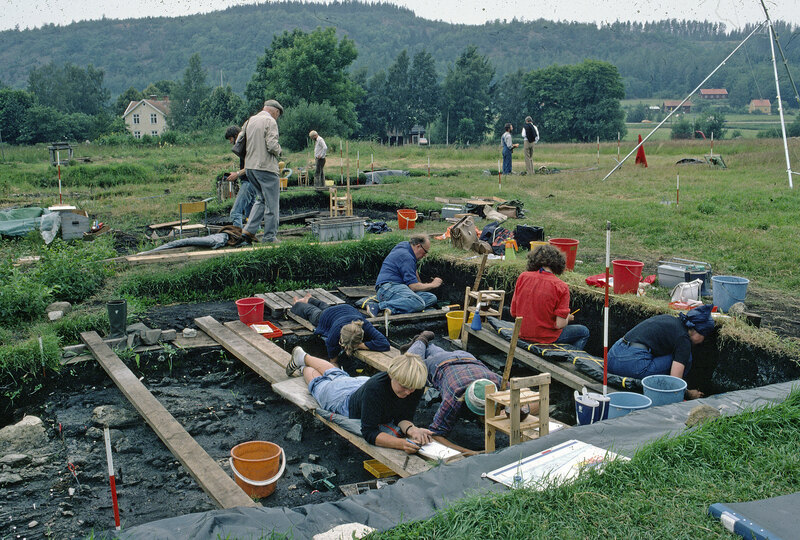 The excavation area was a mire with bubbling springs at the time of the construction of the wooden platform. Hans Browall has described the setting in his PhD thesis of 1986 (English summary pp 154 – 170) and in his publication of 2011 (English summary pp. 13- 14). Browall, H., 1986. Alvastra pålbyggnad – social och ekonomisk bas. Theses and papers in north-european archaeology 15. Stockholm. Browall, H., 2011. Alvastra pålbyggnad. 1909-1930 års utgrävningar. Kungl. Vitterhets Historie och Antikvitets Akademien. Handlingar. Antikvariska serien 48. Stockholm.